Thanks to Netgalley and Bookouture for the advance copy I received for my honest review. When Melissa was just 8 years old, her mother Eleanor died of breast cancer. Knowing that she wouldn’t be around to watch her daughter grow up, and to share with her the wisdom that is so often passed down from mothers to daughters, Eleanor decides to leave Melissa a book that she will receive when she is 25, explaining many of the things that she won’t be there to share with her in person. 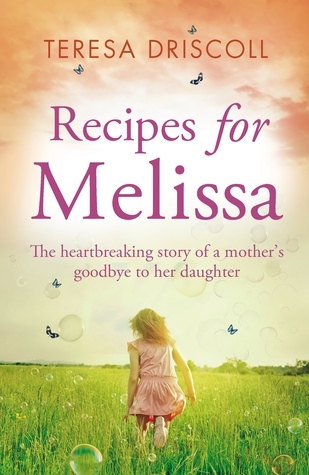 Containing not only recipes and photographs, the book also shares the reasons why Eleanor decided not to tell her only child of her illness and guides Melissa in how to make certain decisions in her own, now adult, life. Told from the perspectives of Melissa, her father Max, and her late mom Eleanor this is a touching, but not overly emotional story of a devastating illness and the impact it has on both the patient and those left behind. It investigates the advances that have been made in the field of medicine regarding the BRCA1 and BRCA2 genes, and although at times (briefly), it did start to sound like a bit of a science or biology lesson, the message here is clear: everyone has the option to be tested, and to take preventative measures if and where necessary. Early detection is key. The themes explored here are realistic ones. Max, tentatively wondering if he should take further his attraction to the lovely Anna; Melissa’s fear of marriage to the steadfast Sam and her very understandable reasons for this fear; her uncertainty, at the age of 25, of how to react to receiving such an unexpected gift from her mother, and her exploration into the missing memories of the happy times they’d shared. While she tries to figure out how she feels about all of this, she prefers to keep her mother’s book to herself, not sure of how Sam and Max will react to it when she does share it with them. While I could understand her reluctance to tell her father about it immediately (wondering if he’d feel excluded, and why his late wife hadn’t left something similar for him), I did struggle to understand why she felt she couldn’t tell Sam about it. It was especially insightful to read Eleanor’s chapters and to follow her journey, her thoughts and fears as she wrote in her book for Melissa. How could one ever know the pain of a mother leaving a legacy for her child, knowing that she will not be there for all those important life-events when a daughter so desperately needs her mother by her side? And how do I even begin to describe that this is heart-wrenching, but subtle at the same time? Driscoll has achieved a marvellous balance in her writing: not over emotive, but still poignant and moving. It is really masterfully authored, especially for a debut novel! A thoroughly enjoyable book despite the subject matter, and a new author who shows a lot of promise. We’ll undoubtedly be looking forward to her next book. I thought I would need a box of tissues with this book and even though it was obviously sad in places, overall I thing the author did a good job with this book. I fully agree. She did a great job – wasn’t over-emotional, but moving and poignant in the all the right places.